The context of Killer Mike's sexist remark about Hillary Clinton's uterus doesn't help him. Killer Mike Made a Remark About Hillary Clinton’s Uterus. It Doesn’t Sound Better in Context. 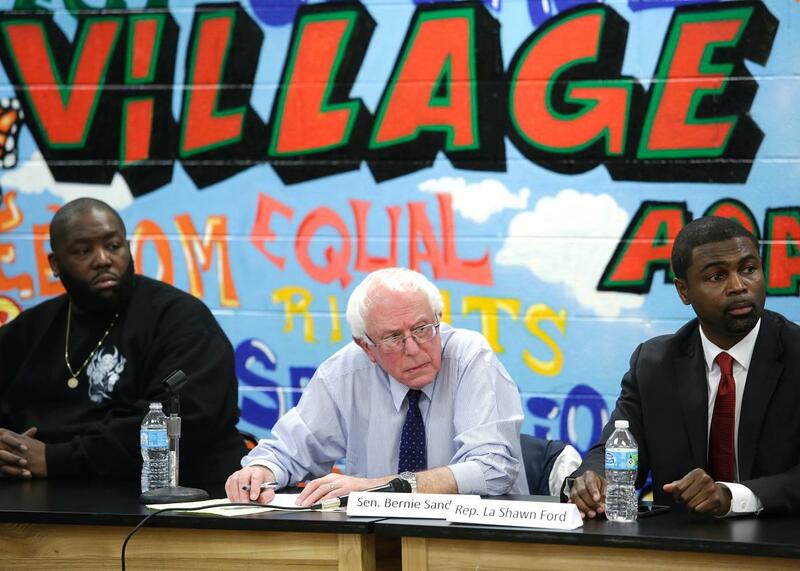 Killer Mike, Bernie Sanders, and Illinois state Rep. La Shawn Ford on December 23, 2015 in Chicago. Stalwart Bernie Sanders supporter Killer Mike is catching flak for using a fellow Sanders supporter’s quote—“a uterus doesn’t qualify you to be president of the United States”—in a speech he made on behalf of the candidate in Atlanta on Tuesday. But Killer Mike did say that. He made a vaguely sexist, incendiary remark that paints a woman politician as little more than a 3D printer for fetuses, then absolved himself of all accountability because another woman said it first. In this case, context doesn’t make things better. If Killer Mike had said something like, “It’s a shame that our own backers have been saying some weird things lately, reducing female candidates to a collection of reproductive organs. For example …” or “I would never say something like …” he’d have an argument for contextual nuance. But he didn’t! He set up a straw man about gender-related arguments for Clinton’s candidacy and used the “uterus” rebuttal to knock it down. When a campaign surrogate quotes a fellow supporter to support his own statement, it’s safe to assume that he agrees with the sentiment. If he’d actually thought the wording was insensitive, he could have paraphrased. Elliott’s response does illuminate the strategy behind Trump and Sanders’ secondhand sexism, though: If you want to belittle an opponent through misogynist rhetoric but don’t want the backlash, don’t do it yourself—repeat someone else. But as Killer Mike’s case demonstrates, it’s hard to keep sexism at arm’s length while reaping its rewards.